These are my live-TeXed notes for Professor Bhargav Bhatt's Eilenberg lectures Geometric aspects of p-adic Hodge theory at Columbia, Fall 2018. Notice that Bhargav has written up his own notes (read those!) I keep the live-TeXed notes here for the sole purpose of reinforcing my understanding. The goal of this series to explain prismatic cohomology, which unifies various cohomology theories in -adic geometry. The motivation comes from the classical de Rham comparison theorem. Notice that RHS is the cohomology of the holomorphic (or algebraic, hence the name "Serre") de Rham complex of , which depends on the geometry of , while LHS only depends on the topology of . Explicitly, the isomorphism is given by integration along cycles and each homology class defines an obstruction to integrating -forms on . RHS is rather computable (e.g., by Macaulay) using the defining equation of , which helps one to obtain topological information about . Conversely, the comparison shows that deforming the complex structure without changing the underlying topology still keeps holomorphic invariants. Question How to see mod cohomology classes (or equivalently, -torsion classes) on "geometrically"? Answer At least when is algebraic, these give obstructions to integrating -forms on " ". Let be a smooth closed subvariety, whose defining equations live in . Assume that is still smooth mod (i.e., good reduction outside ). Theorem 2 (Bhatt-Morrow-Scholze) In this set-up, for any . We have Here is the associated complex analytic manifold, is the reduction of mod , and is the algebraic de Rham cohomology. The inequality in Theorem 2 can be strict (examples can be constructed using fibrations with no sections but admitting sections mod ). For large enough, both sides are equal to the dimension of . For a fixed , the Euler characteristics of both sides are the same. The inequality cannot be upgraded to a "naturally defined" subquotient relation: there exists a version of the inequality for mod coefficients, and there is an example such that LHS = while RHS = . The inequality is also valid for any proper smooth formal scheme , where is a -adic valuation ring (after replacing singular cohomology by etale cohomology). In this case, if , then the inequality is actually an equality (this recovers earlier results of Faltings, Caruso). The inequality also holds true for semistable reduction (Cesnavicus, Koshikawa). They basically carried out what we did for the good reduction case. Corollary 1 If . Then has no -torsion. This gives an algebraic way to control the torsion in singular cohomology. Conversely, torsion in singular cohomology forces de Rham cohomology to be larger, as in the following example. Example 1 Suppose is an Enriques surface in characteristic 2. Then has the form for some Enriques surface in characteristic 0. is always a quotient of K3 surface by a fixed point-free involution, so has fundamental group . So the inequality in Theorem 2 implies that even though (this recovers an example of Illusie, W. Lang). There is an identification . There is an injective map Notice that a) + b) clearly implies Theorem 2. Fix a prime for the rest of the semester ( is a very good prime for computation in prismatic cohomology!) Set . Let a "Frobenius lift" on from . Let be the ideal defining the "diagonal" of . Let be (the -adic completion of) a smooth -algebra. Write , and , where is an algebraic closure of . Let be the algebraic de Rham complex of . (de Rham comparison) (the diagonal computes the de Rham cohomology of ). In particular, (the origin gives the de Rham cohomology of ). (etale comparison) (the -axis) recovers the -etale cohomology of . In between the -axis and the diagonal we obtain the -etale cohomology of . This theory globalizes and for proper, we have the hypercohomology of the resulting complex gives the cohomology theory mentioned before. The (etale comparison) is literally true in this proper case. The triple is an example of a prism (a commutative ring with a Frobenius lift and a principal ideal which behaves in a particular way with respect to the Frobenius lift). This theory actually works over any prism. For example, one can take with , and , where is the -analogue of (which recovers when ). Let be the -adic completion of the Laurent polynomial ring over . Then In this case the prismatic complex is given by -adic completion of the -deformation ( -de Rham complex) It will take us a while to obtain this explicit formula, as the construction of the prismatic complex is not directly related to -deformations. Let be a (commutative) ring with a map such that . Then for each , we have . The notion of -ring is trying to remember (rather than ). Notice that if is -torsion-free, then is a function of . If is a -ring, then gives a ring map lifting . If is -torsion-free, then a) gives a bijection between the -structures on and endomorphisms lifting on . Remark 3 We also have an asymmetric expression which is sometime useful. There is a unique -ring structure on , given by = identity. Then . One can check this is the initial object in -rings. Let . Then for any polynomial , the map gives a -structure on . Let be a perfect field of characteristic . Then the ring of Witt vectors (the unique -adically complete and -torsion-free ring lifting ) with (induced by on ), is a -ring. Let -algebra. The any ring map gives a -ring on (as we can write down by dividing ). Let (not -torsion-free). Then there exists a unique -structure on with (the existence would not be true without quotienting ). So there can be -torsion in -ring. However, cannot kill 1 as the following lemma shows. Lemma 2 There is no nonzero -ring where for some (think: is a " -derivation", which lowers the order of -adic vanishing by 1). Definition 2 An element in a -ring has rank 1 if . This terminology is motivated by -theory where comes from the Adams operator and when , is what the Adams operator does on line bundles. Reference: C. Rezk, Etale extensions of -rings. Using these formulas, it is easy to check the following lemma. Lemma 3 Let be a -ring. Then the map is a ring map lifting the identity after the restriction map And conversely, any section of the restriction map gives a -structure on . Lemma 4 The category of -rings has all limits and colimits, and they are computed on the underlying rings (i.e., limits and colimits commutes with forgetful functor to rings). Remark 5 The lemma implies that the forgetful functor has both left and right adjoints (adjoint functor theorem). The right adjoint is nothing but the Witt vector functor (Joyal). The left adjoint is the free object functor described as follows. Lemma 5 The free -ring on a variable is given by and . Remark 6 Notice that is a -ring: the map extends uniquely to a Frobenius lift on . This construction works for the universal property by looking at what does on the generator. Remark 7 The free -ring is -torsion-free! Example 4 Consider say sending (or any other polynomial). Pushing-out along we obtain a -ring in which . However, it is hard to explicitly compute , as free -rings are of infinite type. Lemma 6 Let be a -ring. Let be a multiplicative subset such that . Then has a unique -structure compatible with that of . Proof First we assume that is -torsion-free. Then there exists a unique map compatible with on . Since is also -torsion-free, and is a lift of Frobenius on , we obtain a unique -structure on . Remark 8 Similar results hold for etale extensions of -rings and quotients of -rings. Now we discuss a property that is special to the category of -rings. Definition 4 A -ring is perfect if is an isomorphism. Perfect and -adically complete -rings. The equivalence is via , and . Lemma 7 If is a -adically complete -ring and is a -torsion element, then . In particular, perfect -rings are -torsion-free. We recall the following standard construction. Lemma 8 If such that . Then . These 's are called the Teichmuller coordinates of (though these coordinates does not respect the ring structure). For a commutative ring , we write to be the Jacobson radical of . A more useful way to think about it is that it consists of "small" elements We will always assume that (so all other prime numbers are invertible in ). Definition 6 An element in a -ring is distinguished (or primitive) if (this terminology dates back to Fontaine). Since is a ring map, we know that if is distinguished, then is also distinguished. A distinguished element can be thought of as a "deformation" of . (crystalline cohomology) . Then is distinguished as . In fact, is distinguished in any -ring . ( -de Rham cohomology) ( ). Then is distinguished. In fact, consider the map . This a -map. Moreover, is a unit if and only if is a unit (as is topologically nilpotent). Now , so is a unit, hence is a unit. The intuition here is that specializing to allows one check to an element is distinguished more easily. (Breuil-Kisin cohomology) ( ). Then is distinguished. One can check this using the specialization . (here is even "smaller" than as contracts ). ( -cohomology) -adic completion of ( ). Then is distinguished (from b)). In all these examples we know how to deform the de Rham cohomology from to , but the constructions are different (at least three constructions). Our goal is to uniforms these different constructions. Lemma 9 Let be a distinguished element in a -ring. Assume . Then is also distinguished for any unit . Lemma 10 (Irreducibility) Assume is distinguished. Assume . Then is distinguished and is unit. (In particular, in a -ring there can not be a square root of ). Lemma 11 Assume . Then is distinguished if and only if . In particular, the condition that is distinguished only depends on the ideal . Remark 9 Geometrically, the condition says that the intersection of the two closed subschemes defined by and is completely supported in characteristic . Remark 10 This lemma will be the basis of the definition of a prism, as the condition depends only of (which uses less information than remembering ). Lemma 12 Let be a perfect -algebra. An element is distinguished if and only if is a unit, where is the Teichmuller expansion. Any distinguished element of is a non zero divisor. If is distinguished, then has bounded -power-torsion. In fact, . A prism will be a -ring together with an ideal that is locally cut out by distinguished elements (but not necessarily globally). It is also more convenient to assume that it is "complete" along the ideal. We thus need a good notion of completion (for non-noetherian rings). Definition 7 Let and . An -complex is derived -complete if for any , is 0 in (here is the right derived functor of the inverse limit functor). This is equivalent to where acts on by . Notice that the completion here is less naive (using the noetherian ring instead of ). See notes for the rest of the assertions. All derived -complete -complexes form a triangulated subcategory closed under product. It has a left adjoint . is derived -complete if and only if each (put in degree 0) is derived -complete. All derived -complete -modules form an abelian subcategory of all -modules. (Derived Nakayama) Assume is derived -complete. Then if and only if . is (Zariski) locally generated by distinguished elements. Definition 8 A -pair consists of a -ring and an ideal . defines a Cartier divisor on . Prisms will be the objects of the prism site. Definition 10 A map of prisms (a ring map sending into ) is (faithfully) flat if is (faithfully) flat. Here flat means that the target complex has cohomology only in degree 0 and this cohomology is flat over the source. Definition 11 A prism is called perfect if is perfect; crystalline if ; bounded if has bounded -torsion. Every prism we will encounter will be bounded. Any -torsionfree and -adically complete -ring gives a prism . Perfect prisms = perfectoid rings. We don't know a natural example of a prism of where is locally principal but not principal (though abstract examples exist). The following lemma shows that is not far from principal. Lemma 13 Let be a prism. Then is principal and any generator is a distinguished element. In particular, (exercise). Lemma 14 Let be a map of prisms. Then is an isomorphism (so a map of prisms is determined on the underlying -rings). Definition 12 A commutative ring is perfectoid if for a perfect prism . Let be a perfect and -adically complete -ring, and . Then for a perfect -algebra and (Theorem 4). So any perfect -algebra is perfectoid. with is a -torsionfree -ring, and is generated by a distinguished element. So is a perfectoid ring. Lemma 15 Let be a perfect -algebra. Let . Then ( -torsion in ) is equal to for any . (The latter is killed by a small power of , known as an almost zero module). Corollary 4 Let be a perfect prism. Then . In particular, perfect prisms are bounded. Theorem 5 The functor gives an equivalence between the category of perfect prisms and the category of perfectoid rings. Proof The key is to recover form . We claim that , where (a perfect -algebra) is Fontaine's tilting functor. Definition 13 Let be a perfectoid ring. The tilt of is . Write , and write . Example 8 . Then (a "2-dimensional" object), and (all nilpotents in are killed when passing to the perfection). There exists such that and . The radical is a flat ideal and (the beginning of almost math). If is perfectoid, then is perfectoid (and -torsionfree), and is a pullback diagram. So one can build any perfectoid ring using a -torsionfree perfectoid ring and a perfect -algebra . In particular, is reduced. We will let be a "base" prism. Assume is generated by a distinguished element and is bounded. (crystalline) Let be any -torsionfree, -complete -ring and . (Breuil-Kisin) Let with and , where is any Eisenstein polynomial (e.g. ). ( ) Let be a perfectoid ring and . ( -de Rham) Let with , and . gives differential forms on relative to . is related to etale cohomology of . Definition 14 The prismatic site of relative to consists of prisms over together with a map over . (Notice the direction of the map is different from the crystalline site). Pictorially we have We will write it as . Definition 15 Define functors and on given by sending to (an -algebra over ) and (an -algebra) respectively. (In the perfectoid case and ). One should really define as the opposite of the above definition, so and are presheaves (we will focus on the affine case as the gluing will be easy). Even though the definition of makes sense for any , the theory works best for formally smooth (or locally complete intersection). The same comment applies to the crystalline site. Let . Then is the category of prisms over . In particular, it has a initial object and hence the prismatic cohomology will be simply . Let (the -adic completion of ). Then there is no initial object. There exists formally smooth lift of together with a -structure on (e.g., and . Then . (One can also do the same for any ). Definition 16 The prismatic cohomology of is defined to be It admits a Frobenius action (as the category admits a Frobenius action). Definition 17 The Hodge-Tate cohomology of is defined to be It no longer has the Frobenius action (but is linear over the larger ring ). These both are commutative algebra objects. Example 11 Let . Then . Remark 13 Since , we know that we have (a quasi-isomorphism) . Since everything is complete, we can detect many things (e.g. vanishing) of using . (strictly graded commutative) if is odd (which only matters in characteristic 2). Remark 14 The differential depends on the choice of . There is a way to avoid this dependence (which introduces certain Breuil-Kisin twists). Theorem 6 (Hodge-Tate comparison) is an isomorphism (as genuine complexes). In particular, And so can be represented by a perfect complex (this is the source of finiteness in the global situation). The Hodge-Tate comparison gives the Cartier isomorphism when (without the extra Frobenius twist). 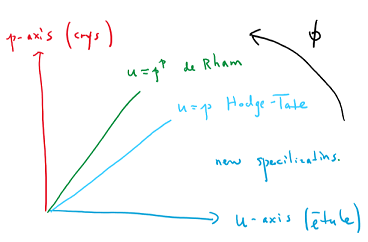 One can work out the Hodge-Tate comparison explicitly for the -de Rham complex (see notes). How to compute cohomology of categories? It turns out to be extremely simple. So in order to compute the cohomology of the prismatic complex, it suffices to find a weakly final object and compute its self-products. Lemma 19 Let be a -pair over . Then there exists a universal map to a prism over . We denote this universal by (think: the universal prism where becomes divisible by ). Corollary 5 has finite nonempty coproducts. The goal today is to sketch a proof of the Hodge-Tate comparison theorem, which is divided into two steps. If (characteristic case), prove the crystalline comparison for (before reduction). Use the Cartier isomorphism when to deduce the Hodge-Tate comparison theorem in general. Fix a -torsionfree ring , and a smooth -algebra . One can check that there exists an induced surjection with kernel having divided powers. The map is universal with this property (hence the name envelope). Example 12 Let , , and . Then is the divided power polynomial ring. One can check that has the cohomology of a point ( , ). This is the characteristic analogue of the Poincare lemma. Theorem 7 (de Rham-crystalline comparison) If is a smooth lift of to . Then In particular, the de Rham complex on LHS is independent of the lift . Remark 16 In the non-affine situation, the lift may not exists but RHS still makes sense. Remark 17 The advantage of this comparison is that the definition of LHS does not involve differential forms directly. Theorem 8 (Cartier) This map is an isomorphism. Remark 18 See N. Katz, Nilpotent connections and the monodromy theorem for a good exposition of the Cartier isomorphism. Lemma 20 Let be a -torsionfree -rings. Let be an (ind-)smooth -algebra over . Let such that is a non-zero-divisor on . Then Here LHS means formally adjoining in -rings, and the RHS is the divided power envelope. Proof First consider the free case over . We have a pushout diagram Notice that the left vertical arrow is faithfully flat, and hence the right vertical arrow is faithfully flat, thus is -torsionfree. Corollary 7 Let be a bounded prism. Let be a free -algebra over . Let that form a regular sequence mod . Let . The derived -completion of is -completely flat over . (the prismatic envelope; so in this case one can avoid transfinite construction in Lemma 19). Let be a -torsionfree complete -ring. Then is a bounded prism. Let be a smooth -algebra. Theorem 9 There exists a canonical isomorphism of commutative algebra objects in , compatible with the Frobenius action on both sides. Let us explain why there is a canonical morphism from LHS to RHS. Choose a free -ring together with a surjection . Recall that by definition . Since is now chosen to have a -structure, we know that is a cosimplicial -algebra over . On the other hand, the kernel of has divided powers. Consequently, we have This the key relation between the -structure and divided power structure and gives a commutative diagram Notice that the lower right part of the diagram gives a cosimplicial object in the prismatic site . Thus we obtain a canonical map So by adjunction we obtain a map One can check this is an equivalence by explicitly computing both sides using Cech-Alexander complexes and using Lemma 20 to identify -structures and divided powers structures. Let be a bounded prism. Let be a formally smooth -algebra. Now let us sketch a proof of the Hodge-Tate comparison (Theorem 6). Deduce the Hodge-Tate comparison from the crystalline comparison (Theorem 9) and the Cartier isomorphism (Theorem 8) when (and worry about the Frobenius twist when is not perfect). In general, set . Then the irreducibility lemma for distinguished elements (Lemma 10) implies that in . We look at the base change along . Using Lemma 20, we may deduce the theorem from the previous case . Corollary 8 For any formally smooth -scheme , one can define its prismatic cohomology , compatible with passing to affine open subsets (i.e., ). Remark 19 To check is a sheaf, it suffices to check it is a sheaf modulo , which is true by identifying with differential forms via the Hodge-Tate comparison. Our next goal is to explain how to extend the prismatic cohomology to the singular case. We will need to derive the functor of Kahler differentials, which is a functor from rings to modules. Since the category of rings is not abelian, we need some formalisms on non-abelian derived functors. Let be a commutative ring. Let be the category of finitely generated polynomial -algebras. Consider a functor e.g., . To derive , we view as "projective" objects in . commutes with geometric realizations, i.e., if is a simplicial resolution of in , then . Here is treated as an -category. is the homotopy colimit of , i.e., the direct sum totalization of the associated bicomplex. There exists a canonical choice of a simplicial resolution such that each is a (possibly not finitely generated) polynomial -algebra: (this is good for functoriality issues, but not so useful for explicit computation). Definition 22 (Cotangent complexes) Define the cotangent complex to be . If is smooth, then . If is surjective with kernel , then and . Moreover, the other vanishes if is generated by a regular sequence. This will be sufficient for most explicit computation we will encounter. If is a local complete intersection, then is concentrated in two degrees given by and . If is not a local complete intersection, then is unbounded (a conjecture of Quillen, proved by Avramov). Fix a ground ring of characteristic . Definition 23 Define the derived de Rham cohomology to be . In char 0, for an affine space the functor is a constant functor so there is no higher derived de Rham cohomology. But in char , even for an affine space has a lot of cohomologies (given by the Cartier isomorphism). The following property helps us to control the derived de Rham cohomology. Proposition 4 (Derived Cartier isomorphism) For any , there exists an increasing exhaustive filtration (conjugate filtration) on equipped with canonical isomorphisms where . More precisely, we have a lift of into the filtered derived category . Corollary 9 If is smooth, then . The moral here is that if we have a functor whose cohomology can be described in terms of differential forms, then its derived functor should also has a description in terms of differential forms. We will realize this idea for prismatic cohomology as well. Definition 24 The derived prismatic cohomology is obtained by deriving where is the -adic completion of , and is the derived category of -complete -complexes. Define which is the same as the derived functor of (as the non-abelian derived functor commutes with filtered colimits, in particular with ). One can check that if is the -adic completion of a polynomial -algebra. We have the following derived version of the Hodge-Tate comparison. Proposition 5 For any , we have an increasing exhaustive filtration on such that in . From now on by abuse of notation we will write . is a commutative algebra object. Let be a perfect prism (e.g., , where ). Let be a -complete -algebra. Our next goal is to construct a "perfectoidization" of . It may not be perfectoid, but better be thought of as a "derived perfectoid ring". We will realize this using the prismatic cohomology of . First let us look at the case of characteristic , where we already know what should be. Definition 25 Let be a perfect field of characteristic . For any -algebra , define . The map is the universal map from to a perfect -algebra. Example 13 Let . Then . Proposition 7 Let be a -algebra, the prefection of the derived de Rham cohomology (where is induced by the Frobenius on ) identifies with via the projection . Now we can do the same thing for prismatic cohomology. Proposition 8 Let , . Let be a -algebra. The perfection identifies with via the natural map . Corollary 10 We have a natural identification of ( -completion) and . Now let us come to the mixed characteristic case. Let be a perfect prism. Let be an -algebra. We use the prismatic cohomology to define the perfectoidization of . is a commutative algebra object, and is an isomorphism on it. If is already perfectoid (e.g., ), then (check: , the unique lift of from to ). Let . Let (a torus). We use the fact that (more on this later) Then one can compute that where and for any . Notice that when specializing to the term in degree one of this two-term complex is zero and we obtain a complex with one term. However, note that the element (= the image of ) in degree one is not a co-boundary, and also nonzero in (= nonzero mod ). Therefore is genuinely derived (with nontrivial higher cohomology). (there is no cohomology in negative degree; reason: power operation in homotopy theory). If (i.e., in degree 0), then is a perfect prism, and is a perfectoid ring. is independent of the choice of . The functor commutes with faithfully flat base change . As an application, we now reprove one of the key lemmas in André's recent breakthrough on the direct summand conjecture. Theorem 10 (André) Let be a perfectoid ring. Let . Then there exists -completely faithfully flat map of perfectoid rings such that has a compatible system of -power roots in . Remark 22 This theorem is highly nontrivial. For example, take , . Notice that there are no -power roots of in . Andre's proof used the full power of the theory of perfectoid spaces and in particular the tilting equivalence. Proof Let be the perfect prism corresponds to . Let be the -adic completion of . Then is -completely faithfully flat. We claim that taking solves the problem: i.e., is perfectoid and is -completely faithfully flat. It suffices to show the latter is true (as faithfully flat implies living in only degree 0). Equivalently, we need to show that is -completely faithfully flat. Now it suffices to show that each individual term in the perfection is -completely faithfully flat over (use the stability of faithfully flatness for , and use is perfect to change the twisted -module to -module structure), which is equivalent to showing that is -completely faithfully flat. Corollary 11 Let be a perfectoid ring and an ideal. Let . Then lives in degree 0, and is surjective. Remark 23 The corollary can be rephrased in Scholze's language (see his torsion Galois representations paper): the notions of Zariski closed and strongly Zariski closed (cut out by ideals coming from characteristic ) are the same. Example 16 Let . Let and . I don't know how to describe explicitly (or even write down a nontrivial element in the kernel explicitly). Let be a perfect prism. Let be a -complete -algebra. Assume is finitely generated over and is bounded. Remark 24 This etale comparison can be viewed as a description of the nearby cycles in terms of differential forms. Reduce from to (most interesting step). Reduce to semiperfectoid (quotient of perfectoid; its prismatic cohomology lives in degree 0). Reduce to perfectoid (for which the theorem was known before: dates back to e.g. Fontaine-Wintenberger in 70's). Step (a) A continuity property inspired by topological cyclic homology. Definition 27 Let be an -algebra and . Define the category of Frobenius modules and a subcategory such that is -complete. The colimits in are computed by the -completion of the usual colimit. The fixed point functor commutes with colimits. Let , then the perfection induces an isomorphism on . Proof Let be a diagram in . We have a commutative diagram Then (a) is equivalent to , and (b) is equivalent to . As is uniquely -divisible, we know that . Therefore it suffices to show that , or equivalently, commutes with colimits. The upshot is that to prove the Theorem 11, it suffices to show the same thing for (after the perfection). Step (b) Let be a polynomial algebra. We take the perfectoid ring . We have a faithfully flat map . Let be the Cech nerve of (i.e., ). Then each is semiperfectoid. For more general , choose topological generators to get a surjective map . Repeating the previous construction we obtain , where each is semiperfectoid. Now the strategy is to reduce Theorem 11 for to the same thing for . (descent for etale cohomology) (true for any torsion contractible sheaves). (descent for prismatic cohomology) and the same for and (the proof uses tools developed in Akhil Mathew's undergraduate thesis). Step (c) Let be semiperfectoid and be its perfectoidization. By Corollary 11, we know that lives in degree 0 and hence is perfectoid. We claim that both sides of the desired isomorphism do not change when replacing by . For the RHS, we claim that In fact both reduce to mod (by the Hodge-Tate comparison and the definition of ), and hence the claim is true by the derived completeness of both. For the LHS, one shows that induces an isomorphism of associated -sheaves (which we have not covered) and one gets (by a theorem) that they have the same etale cohomology for the generic fiber. Therefore it remains to prove the etale comparison when is perfectoid. In this case, by a (classical) theorem, we have (in modern terminology, this can be proved using the pro-etale site of perfectoid spaces and the exactness of the Artin-Schreier sequence). Since is perfectoid, we have and hence . Thus we have proved the etale comparison when is perfectoid. In particular, the -etale cohomology of lives in only two degrees (in fact, by the same etale comparison theorem with nontrivial coefficient systems, one can show that is a ). Now let us come back to prove our main application. Proof Let be the perfect prism associated to . So . The map induces a map , and a map of perfect prisms . The prismatic complex is obtained by gluing for all open . Similarly, we have the prismatic complex . We have an base change isomorphism (by the Hodge-Tate comparison) (Notice that since is a formal scheme, as topological spaces and we can identify sheaves on them). Let , and similarly define . We claim that is a perfect complex, i.e., represented by a finite complex of finite free modules. To prove the claim, it suffices to show that . This is true by the Hodge-Tate comparison: has a filtration whose graded pieces are given by , which is perfect since is proper and smooth. The RHS is given by which is given by (the Frobenius of twist) by the crystalline comparison for prismatic cohomology. Lemma 22 Let be an algebraically closed field of characteristic . Let and . Then is injective, and moreover an isomorphism when is an isomorphism. As an analogue of crystalline cohomology being the de Rham cohomology of a lift, we would like to compute on the nose (as a genuine complex). We will work with with , and . Let . Definition 28 (Aomoto, Jackson) Let . We define its -de Rham complex (depending on the choice of ) where we define the -linear map Notice that the definition makes sense since . Notice that . Therefore on the nose. We have a similar construction for . Remark 25 One can check that is not quasi-isomorphic to the constant deformation . Remark 26 satisfies the -Leibniz rule This means that we may make a dga by making a -bimodule via Notice that this dga is not commutative. Nevertheless, it turns out to be commutative up to all possible homotopies (an -algebra). Definition 29 Let be a formally smooth -algebra. A framing of is a formally etale map We call such a framed pair. Conjecture 1 (Scholze) There is a symmetric monoidal functor from formally smooth -algebras to , equipped with natural isomorphisms for each choice of framing. In particular, is a commutative algebra in , and each is an -algebra. Our next goal is to prove Conjecture 1. It is hard to prove from first principle: it is already not clear how to write down the endomorphism of the -de Rham complex for the simple change of variable . Conjecture 1 is closely related to integral -adic Hodge theory, which proves the conjecture after base change along Thus Conjecture 1 can be thought of as a "de-perfection" of this statement. Conjecture 1 is easy after base change along as the -de Rham complex is indeed isomorphic to the de Rham complex over (by Taylor expansion). Conjecture 1 still makes sense if we replace with any -complete ring, but it is not true in this generality. For example, it fails for (as one cannot compute the -etale cohomology of the generic fiber from the special fiber). We will see that the natural general context Conjecture 1 holds is provided by -PD thickenings. Our goal is to construct a -crystalline site whose cohomology is computed by -de Rham complexes. Write with . Let . Let . Observe that the ideals and define the same topology (one is contained in the power of the other and vice versa). The main new ingredient is the notion of -PD thickenings. contains and (the analogue of the PD-structure, see Lemma 20). We call the corresponding -PD thickening. Conjecture 1 will be proved in this generality. is a -PD pairing, and is the initial such pair. More generally for any -completely flat -algebra over , we obtain a -PD pair . If in , then condition (c) is equivalent to that for any , for any (the usual PD-structure requires , but it turns out to not affect anything). Example 18 If , this lemma saying that if , then . is -completely flat over . The map induces an isomorphism . The map is the usual -completed PD-envelope of . Example 19 Let , , and with , . Then one can compute that contains And they form a topological basis over . (This was the motivating example for inventing the -crystalline site). To compute , we use the Cech-Alexander complexes for (compare Theorem 7). Choose a surjection with kernel such that is a -completion of a free -algebra over . We obtain a cosimplicial -algebra over with ideal such that . Taking -PD envelopes gives a cosimplicial object of , Category theory (Lemma 18) then implies that is given by . Let be formally smooth over . Let . Notice that we have the following commutative diagram The left vertical column corresponds to the -crystalline cohomology, and the right vertical column corresponds to the prismatic cohomology. The twist is needed as is not a distinguished element but is. Our next goal is to relate to . In the classical characteristic setting this relation is saying that the crystalline-de Rham comparison does not depend the choice of the lift. One can basically add everywhere in the proof for the classical case, and it works. Definition 33 ( -de Rham complexes for -PD envelopes) Let be a formally smooth -algebra, formally etale over (which is given a unique -structure satisfying ). Assume there is a surjection and is the -PD envelope of . By the following lemma, we can extend the -de Rham complex to (from to ). Lemma 25 Each -derivative extends uniquely to . All horizontal maps give quasi-isomorphisms of the columns (reduce mod and use the Poincare lemma: adding free variables does not change the cohomology). So the bicomplex totalizes to the first column. Remark 28 One may use the -de Rham complex (with the explicit description of the Frobenius in coordinates) to show that is an isogeny (i.e., it has an inverse up to multiplication by , where ). Finally, let us mention how to recover from the topological Homology homology . The characteristic 0 story is classical (Quillen, Connes, Tsygan...). Definition 34 Let be a map of (commutative) rings. Define the Hochschild homology to be (i.e., derived self-intersection of the diagonal in ). To bring the de Rham differential in, one uses the following observation of Connes: has an -action. To see this use ( is obtained by gluing two 's at two points). Then induces a map which is the de Rham differential under the previous theorem. Theorem 17 Assume is smooth, and . Then where has degree 2. Now let us come to the prismatic story. Let be a perfect prism. Let be a smooth algebra over . Definition 36 For any ring , define the topological Hochschild homology (point: tensoring over the sphere spectrum gets rid of the factorials in the denominators). It also has an -action, and we similarly define the topological periodic homology to be the Tate cohomology of . Example 20 (Bokstedt, Hesselholt) Let be perfectoid. Then where has degree 2 (if tensor over instead of the sphere spectrum, one gets the divided power algebra), and . Last Update: 12/11/2018. Copyright © 2015 - 2018, Chao Li.